In this Thursday, Sept. 4, 2014, file photo, an overweight man rests on a bench in Jackson, Miss. Rising numbers of American adults have the most dangerous kind of obesity, belly fat, despite evidence that overall obesity rates may have plateaued, government data shows. Abdominal obesity affects 54 percent of U.S. adults, versus 46 percent in 1999-2000, and the average waist size crept up an inch, too, according to the most recent statistics. 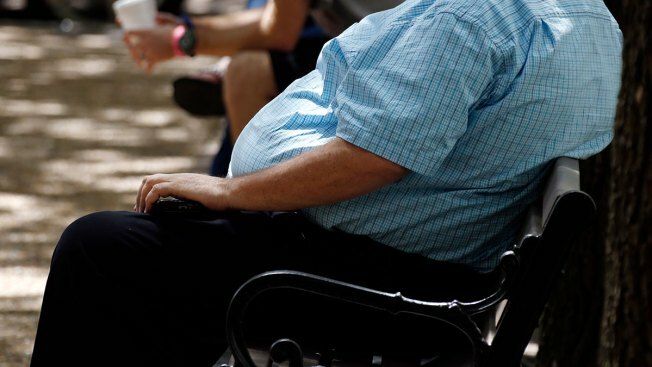 Almost 40 percent of American adults are obese, the highest rate ever recorded for the United States, according to a report released Friday by the Centers for Disease Control and Prevention. Nearly 20 percent of adolescents are obese, also a record high, NBC News reported. That comes out to one in five adolescents aged 12-19. Meanwhile, one in five kids aged 6-11 and one in 10 preschoolers aged 2-5 are obese. "It's difficult to be optimistic at this point," said Dr. Frank Hu, chair of the Department of Nutrition at the Harvard School of Public Health. "The trend of obesity has been steadily increasing in both children and adults." Obesity is medically defined as having a body-mass index of more than 30. Overweight and obese children have a higher risk to stay obese and childhood obesity is linked to a higher chance of early death in adulthood.